Imaging satellites are subjected to several factors that may reduce the post-launch sensor geo-pointing accuracy. Some of these are: launch shock, precipitation of water vapour from the launch at the instrument once in space, and gravity release. Therefore in-orbit geometric calibration is a key technology to continuously guarantee and monitor the geometric quality of satellite imagery. To maximise PROBA-V product’s geolocation accuracy, a continuous and highly autonomous in-flight geometrical calibration/validation software has been implemented in the mission’s User Segment (US). It processes large data volumes with limited human intervention in order to estimate and monitor the Exterior Orientation parameters (boresight angles) and Interior Orientation deformations (CCD line of sight vectors) of each camera of the PROBA-V Vegetation Instrument (VI) on a regular basis. 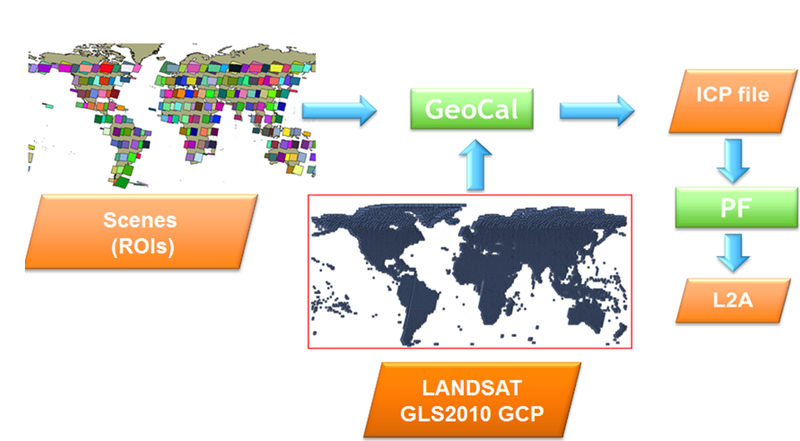 The geometrical parameters are estimated using a large number of globally distributed Ground Control Points (GCP), a priori extracted from the Landsat Global Land Survey GLS 2010 cloud-free dataset (https://landsat.usgs.gov/science_GLS.php). The estimated geometrical calibration parameters are then used to update the Instrument Calibration Parameter (ICP) file that is used by the US Processing Facility. In addition to the calibration step, the Level 2 data produced by the Processing Facility are continuously checked and validated by cross-correlation with the Landsat Global Landsat Survey GLS 2010 dataset. Since Landsat observations have a finer spatial resolution than PROBA-V, Landsat images have been rescaled to 300 m (the PROBA-V product resolution) by means of bilinear interpolation. Three types of geometric errors (absolute, inter-band, and multi-temporal) are monitored on a regular basis to ensure the highest geometric accuracy at any ground location. After more than one year of calibration monitoring, PROBA-V shows an impressive geometric performance stability. The values of the different geometric parameters are stored in the Instrument Calibration Parameters (ICP) files. For each camera there is a separate ICP file. Initial values for parameters are given by the on-ground calibration. In-flight updates of the parameters are computed by the Geometric Calibration and delivered to the User Segment Processing Facility (PF) for the direct geo-referencing of the PROBA-V products. Information on the most recent geometric ICP files and geolocation accuracy can be found in the Quarterly Image Quality Reports and Absolute Location Error plots, respectively.